This is one of those thoughts that comes to you in a moment of clarity with such force that you wonder how it could be that everyone just doesn’t see the truth of it. I had just fulfilled the mandate of the Gospel of Jesus Christ! I had just welcomed Him in the guise of the hungry, “When I was hungry, you gave me something to eat.” Matthew 25! I used to joke that strangers could in fact be demons, (this was when the angel rage was in full swing and I use to make the point that yes a stranger might be an angel but who is to say if it is a good one or a bad one–sort of a twist of the Glenda the Good Witch’s question to Dorothy in the Wizard of OZ, “Are you a good witch or a bad witch?”), but I would ask you to reflect on Halloween a bit more with me. For example if we start viewing every middle eastern looking Arab that we do not know personally as a terrorist we are forgoing an opportunity to see them as Christ (who happened to be of middle eastern descent). Abraham was visited by three strangers (one would presume of middle eastern descent) and he fed them–they turned out to be angels and they gave him a blessing! But let’s suppose that we in fact do come across some terrorists in our daily activities. What if our interaction with them, seeing them as Christ and giving them whatever we have to give at that moment (even if it is only a smile of acceptance) led them to change their whole way of viewing Americans? It is also sad that many miss the point in the other direction. They overdo it in the name of “everyone else is doing it” and light their houses up as though it is Christmas, rather than encountering the little masked Christs in the darkness the way it is intended to happen and does happen in daily lives. The vacuous nature of their souls demands making a show of their giving. Sadly they have already received their reward–the empty praise of their neighbors and friends. 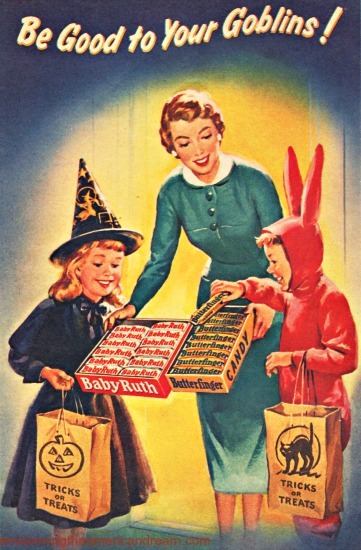 There have been moves lately among some Catholics to have children dress up as saints– this may be a fine thing to do on All Saints day but it totally misses the point of Halloween. We will never be saints, nor will we imitate them, until we open the door everyday and welcome the ghouls we encounter as though they are Christ.